The Mahkuma du Pacha is a law courthouse located right at the heart of Casablanca. The law courthouse was built in the mid 1900s and is known for its classic Moorish influence- giving it a touch of grandeur, rarely seen in other courthouses in the country. 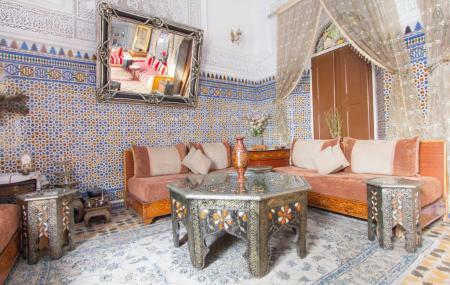 The intricately carved marbled and woodwork showcases the zeal of art in morocco. Take a walk around the premises while you capture glimpses of the building’s beauty in your camera. The courthouse is completely accessible only for group tours. Do enquire about tour timings at the entrance. The Law court is closed on Saturday and Sunday. How popular is Mahkama Du Pacha? People normally club together Dream Village and Square Of Mohammed V while planning their visit to Mahkama Du Pacha. The guards told me that i needed to be a member of a tour, but one of them then kindly allowed me to enter for some time. Un des plus beaux endroits que j'ai visité de ma vie. J'ai eu le bonheur d'y aller dans un créneau où il n'y avait presque personne à part des employés ici et là (tous polis). C'était calme, j'étais seul et je me serais cru dans un REVE. Les images disponibles sur google parlent d'elles même.